Perfect isn't supposed to come along very often in baseball. There's too much imperfect built in. Yet, when Seattle Mariners right-hander Felix Hernandez threw his arms in the air Wednesday afternoon in Seattle, when 27 Tampa Bay Rays had come and gone in order, baseball had its third perfect game in fewer than four months, a record for a major-league season. Hernandez's followed Matt Cain's by two months. Cain's followed Philip Humber's by about seven weeks. Beginning with Cy Young's perfect game in 1904, the first of the modern era, there have been 23, an average of about one every five years. It is, then, an unprecedented cluster of perfect games – five have been thrown in two years and two months, including those by Roy Halladay and Dallas Braden in 2010, and six beginning with Mark Buehrle's in 2009. When the accomplished Hernandez took the ball Wednesday, it was on the very same field Humber threw his no-hitter April 21. When Hernandez began the process of taking apart the Rays, it was against the team that Braden had thrown his perfect game, and Buehrle had thrown his before that. Once an incredibly rare feat – four perfect games were thrown in the 1990s, three in the '80s and none in the '70s – the perfect game has become almost commonplace as the sport attempts to disengage from its steroid era. Since April 2010, 15 no-hitters have been thrown, including Hernandez's. Still, in spite of the now somewhat regular no-hitter alerts and perfect-game sightings, and though credentialed pitchers such as Cain, Johan Santana, Jered Weaver, Justin Verlander and now Hernandez have finished games perfect or nearly so, they arrive with a thunderbolt of anticipation. 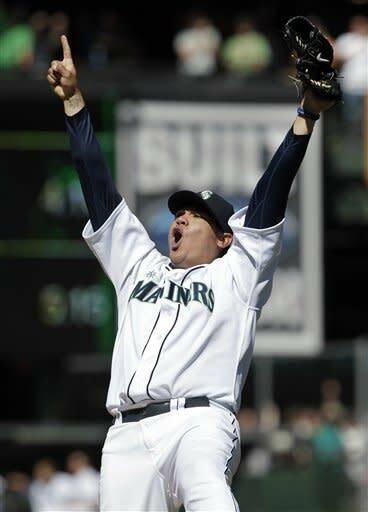 The American League Cy Young Award winner in 2010 and the owner of a one-hitter and four two-hitters in eight seasons in Seattle, the 26-year-old Hernandez was virtually unhittable against the Rays. Over 113 pitches, he struck out 12 of the 27 batters, including five of the final six. His fastball careened into the strike zone at 94 and 95 mph, and his slider and changeup were remarkable biting and deceptive. This is his usual stuff. But it was perhaps his curveball that was the difference between a great game and a historic one. "It was unbelievable," said catcher John Jaso, who was traded from the Rays to the Mariners last November. "It was hard today and had such big break. You gotta tip your hat as a hitter. You can't hit that. No human can." The Mariners, among the weakest offensive clubs in the majors, scratched across a run in the third inning. That was all Hernandez had for support, the ledge he pitched from. Not simply the perfect game, but the win also rode on every pitch. He went to three-ball counts on just two batters &ndahs; Ben Zobrist in the second inning and Sam Fuld in the fourth. He had strike one on 16 batters. When Hernandez struck out the side in the sixth inning the game appeared to be running downhill for the man they call King Felix, and who bears the weight of a franchise that has not seen the playoffs in 11 years and will not see them this year. "Oh man, I don't have any words to explain this," Hernandez told reporters in Seattle afterward. "When Phil Humber threw the perfect game here, I said I gotta throw one. I have to. I've been working so hard to throw one and there it is." Over the decades, or since Young painted his more than a century ago, the perfect game has become known as the precise mix of dominant pitches, precision pitches, a sound defense and an alert umpire. And then luck. 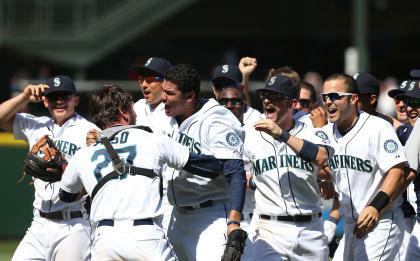 "Today was just one of those special days," Mariners manager Eric Wedge said. "A lot of things have to come together." Over a couple hours on a gloriously sunny day at Safeco Field, with the roof open and the crowd noise growing by the inning, it came together for Hernandez. He is 96-72 in a career that has seen, now, everything but a postseason start. And even something as unlikely as the perfect game, that seemed to be coming. "It almost seems like a matter of time before it happens," Jaso said. "This game, it's weird, a little dribbler or something and it's ruined." For a pitcher such as Hernandez, however, Jaso said, "The odds are going to go in your favor eventually." Hernandez, who by then was sitting beside Jaso, grinned. It didn't matter to him how many perfect games had come in the months before his, or that he stood in the midst of a strange and record-breaking time for them. He knew that this was his – the afternoon, the game, and now the place at the end of 23 men who'd done the same. "It's something special," he said. "This is pretty crazy. It doesn't happen every day."